Book Review- Curtis Sittenfeld's You Think It, I'll Say It — Always Packed for Adventure! 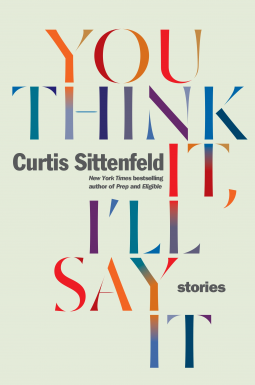 Thank you to Random House Publishing Group for providing me with a copy of Curtis Sittenfeld's short story collection, You Think It, I'll Say It, in exchange for an honest review. PLOT- You Think It, I'll Say It is a collection of short stories from acclaimed novelist, Curtis Sittenfeld. LIKE- Sittenfeld is one of my favorite modern writers and I was absolutely thrilled to have an opportunity to review her latest book, a collection of short stories. Sittenfeld doesn't shy away from the uncomfortable and many of her characters toy with emotional bombshells. They exist on the edge, often crossing the line by acting on their impulses. In the story which provides the inspiration for title of the collection, The World Has Many Butterflies, friends begin to have an emotional affair by playing a strange game: "You Think it, I'll Say It." They secretly play this game when they come in contact at parties and their kid's sporting events. Graham initiates the play by mentioning the title and then Julie begins to tear down the other people in the room, as if she and Graham are conspirators thinking the same thoughts. At first, Julie feels a sense of freedom in speaking as she wishes and saying what's on her mind, but the game becomes increasingly intimate, as she speaks in a way that she wouldn't dare reveal to her spouse. Plausible Deniability plays on a similar theme, with Libby having an emotional affair with her brother-in-law. She feels in her gut that it is crossing the line, but for over a year she continues to send him text messages. At a certain point, they agree to only send one message a day and the message can only be about classical music. Libby sends these incredibly intimate texts about the music she loves. When she becomes pregnant and confronts her brother-in-law regarding this emotional affair and intimacy that they are having, he tries to make it seem like it isn't a big deal. Libby admits that it is a big deal to her, she thinks about him romantically and even though he is devastated that she wants to cut it off, he won't admit that they have crossed the line. He is the narrator of the story, so we know that he loves her more than he should and even more devastating, he realizes that his brother doesn't really love her. Old memories from high school and college also haunt Sittenfeld's characters. A Regular Couple, involves two couples on their honeymoon who meet at a resort in the desert. The wives were high school classmates over two decades ago. The narrator, Maggie, is both intimidated and fascinated with Ashley, who was a very popular girl in their high school. Now, Maggie is a successful lawyer and immediately, Ashley mentions having seen Maggie in the news. Maggie and her husband are staying in the most expensive rooms, while Ashley and her much older husband, are staying in cheaper accommodations. Maggie knows she has reaches success in her career and she even has a "trophy husband"- She admits that her husband, Jason, is far more attractive than she is and she constantly worries that Jason, who does not have as successful of a career, is using her for her money. Maggie is insecure and spending time with Ashley turns her into a mess. Although Ashley seems to have nothing but goodwill towards Maggie, Maggie can't help but try to seek retribution for the way that she was treated in high school. You Think It, I'll Say It is a solid collection and every single story was excellent. No clunkers. I adore Sittenfeld. Her characters engage in cringe-worthy behavior, but their mindset and impulses are always relatable. She understands how people tick and I love to see how her stories play out. She always keeps me guessing and turning the page. Her wicked sense of humor also shines through. DISLIKE- Not a single thing. RECOMMEND- YES, YES, YES!!! I recommend You Think It, I'll Say It and everything else that Sittenfeld has written. I can't wait to read what she writes next. Sittenfeld is such a talent!